This is an impressive yet simple vegetarian dish that can be served as a full entrée or as a side, perhaps to a large family meal. Instead of fancy and complicated holiday cooking, use this easy and festive recipe to bring color to the table. 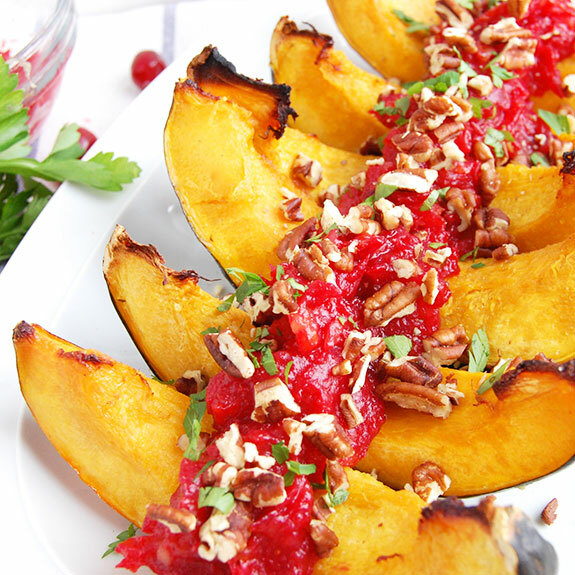 The tangy cranberry apricot sauce is the perfect accompaniment to the sweet roasted acorn squash. 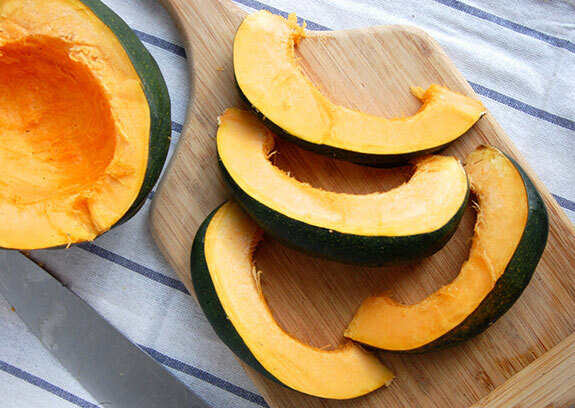 Acorn squash can be one the toughest squash to chop up. I always poke 3-4 holes in the whole squash with a fork and then microwave it for 2-3 minutes to soften it up first. I find this method helps with cutting through the squash. I followed the natural ridges to dice the squash and made long thin pieces with the skin still on. For acorn squash I usually discard the seeds, but if anyone has a suggestion for them please let us know in the comments! My way of indulging with this dish was to use ghee to rub over the roasting the acorn squash. If you don’t want to use that much clarified butter, you can substitute extra virgin olive oil and it will roast just the same. The squash soaks up the ghee and comes out of the oven amazingly delicious, in my humble opinion. Once you put the squash in the oven, you can start making the easy cranberry sauce. 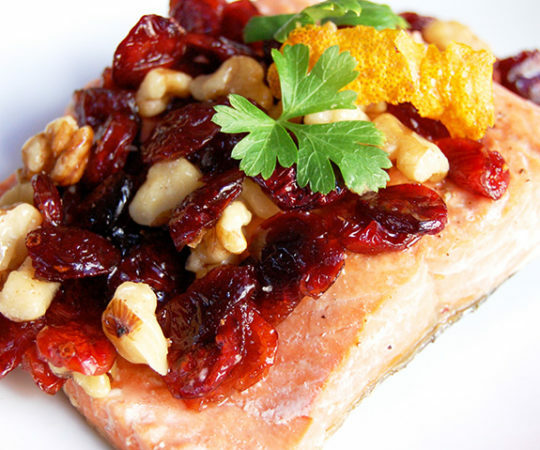 The sauce veers from traditional cranberry sauce by adding apricots. 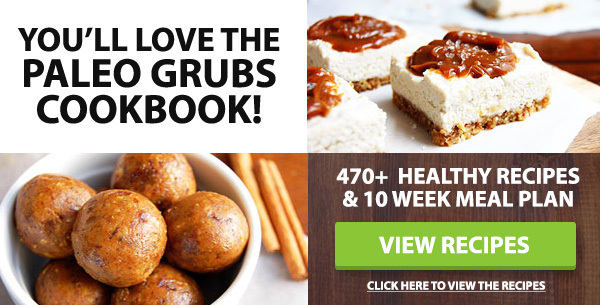 There are so many versions of cranberry sauce and everyone seems to have an opinion about it, but I hope you like this Paleo-friendly version I’ve cooked up. Fresh, tart cranberries are cooked down with a couple ingredients to make the just the right topping for the sweet squash– there will probably be leftover sauce from this recipe. 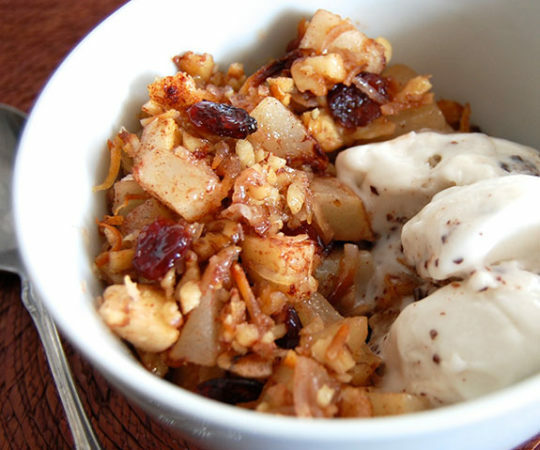 Crunchy pecans were also thrown on top for more texture and flavor. The cranberry sauce can be made ahead of time, which is an added bonus. It will also thicken a bit as it chills, but can be served warm, room temperature, or cold! 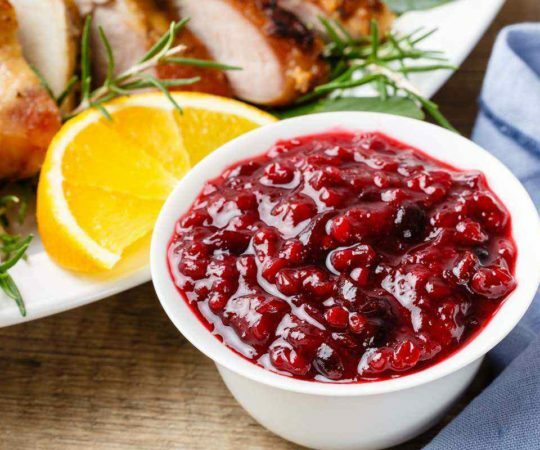 Most people only enjoy cranberry sauce around the holidays, but the recipe could be used any time of year really. The sauce can be served completely on its own as a side, or as a condiment for sandwiches and wraps. Or of course, over some simple roasted acorn squash. 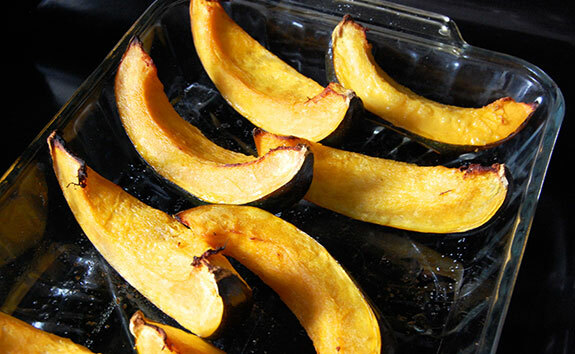 Preheat the oven to 400 degrees F. Cut the squash in half and remove the seeds. Slice it into thin sections and place into a baking dish. Rub the squash with ghee and sprinkle with salt. Bake for 25-35 minutes until completely tender. Meanwhile, combine the cranberries, maple syrup, apricots, orange juice, and orange zest in a saucepan. Cook over medium heat for 10-12 minutes, stirring frequently. Once most of the cranberries have popped, remove the saucepan from heat and set aside. Place into a blender and pulse until it reaches desired consistency. 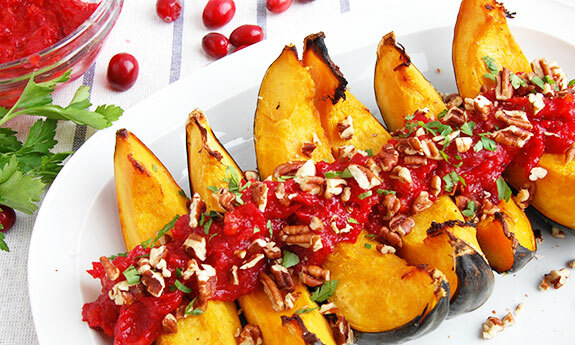 To serve, spoon the cranberry sauce over the roasted squash. Sprinkle with pecans and parsley. Serve warm. I rinse & roast the squash seeds like pumpkin seeds. They are tasty and not as tough as pumpkin seeds. I originally did this for a pet mouse, but our dogs love them too! 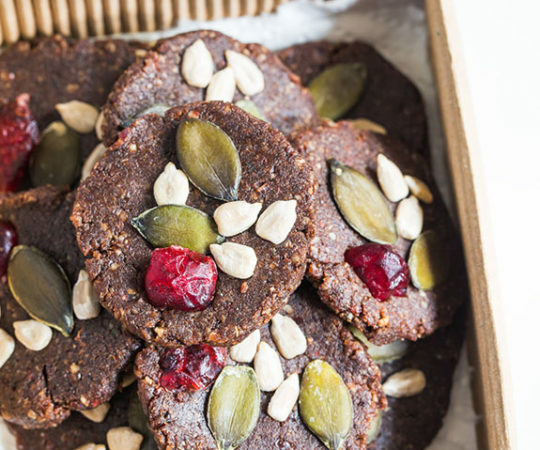 Cheap healthy treats for people or pets! What a great idea! I love pumpkin seeds, so if these aren’t as tough, that’s a nice bonus. I also have two dogs who love healthy treats. I use the seeds for garnish on sweet potato and quash soup. Rinse off seeds and let dry over night, or if you’re in a rush dry with paper towel.